Saint Paul and surrounding areas. I am willing to travel long distance. I am available most any day. Beaches, Parks, lakes and Yards, I can also search water. "IT professional, I enjoy looking for all types of lost items on land and in the water." 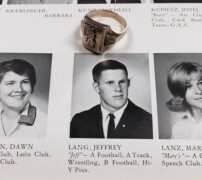 “Reese, Ty and I want to thank you for returning Jeff’s class ring. Such a kind and wonderful thing you do. Jeff was very athletic through high school and college. He was your typical gym rat. Jeff earned his college degrees in Special Education. He was a teacher & administrator for 37 years. We have 2 sons – Ty and Brady.